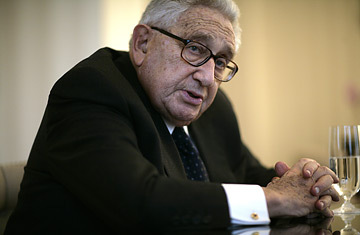 Kissinger on Putin: "He Thinks He is a Reformer"
Henry Kissinger speaks during an interview in Washington. Former Secretary of State Henry Kissinger is well acquainted with Vladimir Putin. TIME met with Kissinger in Washington and they discussed the Russian President's recent moves, his legacy, and how the U.S. should deal with a resurgent Russia. Clearly Putin is the dominant personality in Russia today. Having headed the ballot of the United Russia Party that gained 64.3% of the vote, he controls the Russian parliament, the Duma. At the same time, I do not consider Russia a dictatorial state. A vote of 64.3% shows that there is a significant part of the population that did not vote for Putin. The position of Prime Minister has a different constitutional basis than president. There is therefore considerable scope for evolution. America must not confuse foreign policy towards Russia with seeking to prescribe historical processes. It is important to get our priorities right. Restructuring the domestic situation of Russia cannot be achieved by American designs  particularly in the short term. Russia is a vast country adjoining China, the Islamic world and Europe. Cooperative relations with it are important for peace and global solutions. Of course we have our preferences, and of course we have our sympathies, but we also have to deal with a government in Russia that exists. And we need some understanding for the adjustments required by a country in a period of transition. How do you explain the gap between how President Putin is perceived by some in the West  as aggressive, authoritarian, undemocratic  and the support he enjoys among Russians?